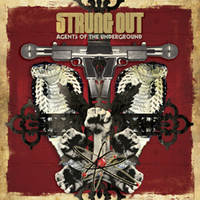 New record from STRUNG OUT, out Sept 29th! PUNK PIONEERS STRUNG OUT CELEBRATE 20TH ANNIVERSARY WITH THE RELEASE OF SEVENTH STUDIO ALBUM . Agents Of The Underground out September 29th via Fat Wreck Chords . Over their tenure as the progenitors of the metal-infused punk sound, STRUNG OUT have yet to get complacent. Instead, like a championship fighter that gets stronger with every round, they continually unleash a battering assault of technical guitar work and gripping melodies. The bandâs latest full-length (7th overall), Agents of the Underground, is a triumphant defense of the title theyâve held for years. Click here to view the bands web site. STRUNG OUT have recently announced their upcoming tour dates, click here to check them out!